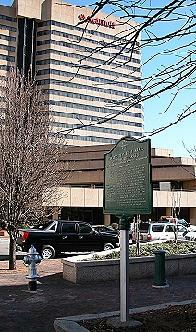 The historic marker, located at Main and Exchange in Memphis, Tn., was dedicated March 2, 2007. The dedication was on the same day that, 153 years earlier, the state of Tennessee granted Congregation Children of Israel its charter. Jews have been part of Tennessee�s economic, social and political life since the late 18th century. 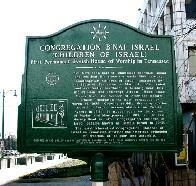 Congregation Children of Israel, chartered by the State of Tennessee, March 2, 1854, rented and eventually purchased a building near this site at Main and Exchange streets. Rabbi Isaac Mayer Wise, the founder of American Reform Judaism, dedicated the new synagogue, March 26, 1858. Growing rapidly, the congregation moved to larger accommodations on Poplar Avenue in 1884. It moved again to the corner of Poplar and Montgomery in 1915, and to East Massey in 1976. Congregation Children of Israel became known as Temple Israel in 1943. The establishment of Congregation Children of Israel, in Tennessee, affirmed the American principles of freedom of religion and assembly. Erected by the Shelby County Historical Commission, the Jewish American Society for Historic Preservation and Temple Israel.